This blog post is intended for informational purposes only. The Civic Federation has not taken a position on a city income tax and does not support tax increases in the abstract. Furthermore, the Federation believes that any new taxes or increases to existing taxes would need to be tied to a long-term financial plan that balances the City’s budget and stabilizes its finances over the long-term. For more information on the myriad of taxes and fees already imposed by the City of Chicago, see the Civic Federation’s annual report on Selected Consumer Taxes in the City of Chicago. Personal income, which includes compensation from salaries, wages and bonuses; dividends and distributions from investments; rental income; and business profit sharing. The income tax base can be narrow or broad. The narrowest base for local income taxes includes earned and proprietary income only, as is the case in Pennsylvania. The broadest tax base includes personal, proprietary and corporate income, as in New York City. The Illinois Constitution provides that home rule units of governments such as the City of Chicago may only impose a local income tax if that authority is granted by the General Assembly, and it has not done so to date. The City of Chicago Inspector General’s Office estimated in 2011 that a 1% municipal income tax could raise approximately $500 million. This figure was calculated by assuming that a 1% city income tax would be imposed on Chicago’s share of the adjusted gross income used by the state to calculate state income taxes in in 2009. According to the Tax Foundation, in 2011 approximately 4,943 local government jurisdictions in 17 states imposed local option income taxes. As of April 2011, the states permitting local option income taxes and the number of jurisdictions in each authorized to levy income taxes are: Alabama (4), California (1), Colorado (3), Delaware (1), Indiana (91), Iowa (297), Kansas (535), Kentucky (218), Maryland (24), Michigan (22), Missouri (2), New Jersey (1), New York (4), Ohio (774), Oregon (2), Pennsylvania (2,961) and West Virginia (3). 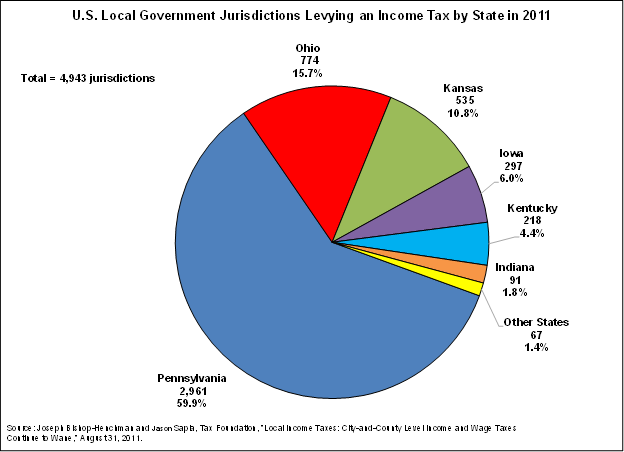 The governments imposing local income taxes were primarily municipalities and counties. Nearly 60% of these jurisdictions are in Pennsylvania. Local income tax rates vary widely. In most jurisdictions, the local income tax is levied on residents as well as nonresidents who work in the taxing jurisdiction. The nonresident tax rate is typically lower than imposed on residents. 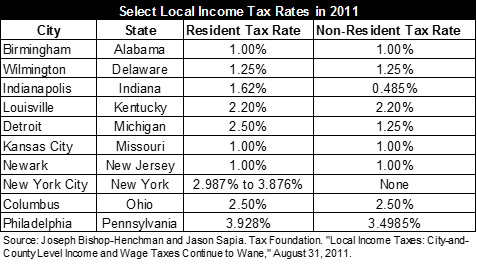 The exhibit below shows a sample of local income tax rates for select jurisdictions in 2011. Most jurisdictions impose a flat rate income tax. New York City, however, has implemented a graduated rate. A local income tax applied to corporate income may negatively impact economic development if it is perceived to create an unfavorable business climate. If imposed on nonresidents who work in a jurisdiction, local income tax revenue can be used to help pay for municipal services and infrastructure used by those nonresidents. What would constitute the municipal income tax base? Would the tax be applied only to residents or to nonresidents who work or do business in the City as well? If so, would the resident and nonresident tax rates be the same or different? Would the municipal income tax be administered and collected by the State of Illinois or by local authorities? If the municipal income tax base includes corporate income, how would nexus be established for taxable business activity? Robert L. Bland, A Revenue Guide for Local Government, Washington, D.C., ICMA, 1989, p. 93. We welcome any questions and feedback about the content of this blog. Please e-mail civicfed@civicfed.org with your query.